PJ's Pawn Plus was first established in 1985. Since that time, our locally owned and operated organization has consistently worked with customers to get them the best deals on merchandise whether they are buying or selling. We offer fair and reasonable prices and services with flexible terms. And we do it quickly! We are a proud member of the National Association of Pawn Shops. At PJ's Pawn Plus, we buy all kinds of things of value. We feature 11,000 square feet of storage space to accommodate the inventory of products we buy and sell every day. Click here to learn more about our products. PJ's Pawn Plus is a safe and friendly establishment for the whole family. Our facility is secure with a safe and well-lit parking lot. If you have been looking for big ticket items such as video game systems, video games or instruments for your children, you can find them here at great prices. No one likes to borrow money, but sometimes emergencies and unexpected expenses make borrowing necessary. A pawn loan is a convenient and easy way to make it through the tough times. Bring us an object of value. We'll hold it as collateral and keep it safe and secure until you can come back to redeem your loan. We treat all of our customers with respect and we promise to do our best to help you through life’s unexpected financial emergencies. Here are some Frequently Asked Questions about pawning. A pawn is a c﻿ollateral-ba﻿sed loan. A customer brings in an item of value and leaves it with the pawnbroker to secure a short-term cash loan. Loans are made for 30 days, but a state-required 60-day holding period means that the customer may leave his or her pledged items in the pawnshop for 90 days without any concern that their item will be sold. What sorts of items do you loan on? We will make loans on almost any thing of value that we can safely store in our store. Common items that customers bring to our store include gold and silver jewelry, firearms, tools, televisions, video game systems and games, musical instruments, stereos, cameras and even DVD movies. Are there items that you do NOT loan on? Currently, we do not accept VHS tapes, tv's that are not flat screen, clothing. If you have a question about whether we’ll take an item, please call. To receive a pawn loan you will need to bring a government-issued ID, your pawn item and any items necessary to operate that item. Televisions, DVD players and other electronic devices must include the original remote control. If a device requires a special charger or power cord, that device must be included with the pledged item. You must provide log-in passwords for computers. Tablet computer and other mobile devices should be disconnected from Cloud accounts (i.e, turn off "Find my iPad") before being presented for a loan. Loans are based on the wholesale value of your item in its present condition. You can assume you will receive roughly half of what a similar item would sell for used, or about 25 percent to one-third of the new price of a similar item. But I paid a lot more than that! Yes, but your item is no longer new. More importantly, if we loaned the full retail value of your item there would be no reason to reclaim your merchandise. You would just go buy a new item from the store, rather than pick up your used item. Remember, you are not selling your item. You are merely borrowing against its value. You will get your item back when you redeem your loan. Do I have to borrow the maximum value of my item? No. In fact, most people only borrow the amount they actually need, even if their item is worth a lot more. The more you borrow, the harder it is to redeem your item. There is no reason to borrow more than you need. Who can take out a pawn loan? Anyone 18 years old or older with a valid government-issued photo ID can take out a pawn loan. You do not need to have a job or a bank account. Obviously, you must be the rightful owner of the property you leave for collateral. You cannot pawn items that don’t belong to you or that are subject to rental agreements or liens. May I have more than one open pawn loan at a time? Sure, many of our customers have several loans with us. Each pawn loan is treated as a completely new transaction. Does anyone else know when I take out a loan? In Missouri, pawnshops are required to file a daily report listing every pawn or buy transaction in their store. We report the name and identification of the borrower, as well as a description (including serial number) of all items pledged. This information is available ONLY to law enforcement agencies. This information is not available to employers, credit bureaus, bill collectors or nosy neighbors. Other than the reporting requirement, all pawn transactions are kept in complete confidence. We will not discuss your pawn loans with anyone. Can I pawn my gun? Sure. We are a licensed firearms dealer and can make loans on guns. Be aware, though, when you redeem your firearms loan you will have to fill out the federal paperwork and undergo a background check before you get your gun back. Picking up a pawned firearm is exactly like buying a gun. If you can’t pass the background check, you will not be able to get your gun back. No one else can pick it up for you, either. What does the loan cost? 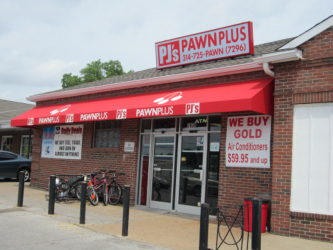 ﻿PJ's Pawn Plus﻿ interest, storage and security fees that equal 16.5 percent of the loan amount for the first 30 days. In other words, a person who borrows $20 would owe $23.30 when they come back to pick up their loan. A $50 loan would cost $58.25 to redeem. The customer who borrowed $100 would pay $116.50 to pick up his pledged item within the first 30 days.......It is important to understand that the same fee applies regardless of whether the customer needs money for one day or all 30 days. Within the first 30 days, the cost of the loan does not change. What if I can’t pick my loan up within 30 days? The state of Missouri requires pawnbrokers to hold unclaimed pawned items for 60 days past a loan’s due date. During this time, a customer’s property cannot be put out on display and it cannot be sold. Obviously, you may redeem your loan and pick up your item any time within this 90-day period. Does it cost more to pickup up loans after 30 days? Yes it does. Loans kept in storage longer than 30 days are overdue and late charges are added to the loan amount. At PJ's Pawn Plus, fees are added on a montly basis. Many customers choose to pay their loan fees each month, even if they can’t redeem their item. This helps customers budget their loan costs and avoid having to pay late charges when they pick up their loan........It is not necessary to make monthly payments, however. As long as you never allow your loan to get more than 90 days behind in payments, you will not lose your pledged items. Can I pay down my loan? We will allow you to pay down the principal on your loan (the amount you initially borrowed) IF you have paid all loan fees and interest owed. Can I borrow more money on an item already in pawn? It depends. If you initially borrow considerably less than your item is worth, we may allow you to increase your loan amount at a later date. Although the loan amount changes, the due date does not and loan fees are based on the new, higher loan amount. We generally do not recommend this practice, but it may be an option. How long can I keep my items in pawn? You may keep your items in pawn indefinitely, so long as you continue to pay your monthly loan fees. If you ever owe more than 90 days worth of loan fees, the law allows us to take your item and sell it. Who can pick up my pledged items? The receipt you receive when you take out your loan is a claim ticket. Anyone who possesses that ticket may claim the item. The only exception to this is firearms. We will only allow the original pledger to redeem a firearm. Missouri law says that you are supposed to notify us in writing if you lose your pawn ticket. That is the only way we can prevent someone else from picking up your pledged items. Without a pawn ticket, only the person who took out the loan originally may pick up their pawned item. Please bring your identification with you if when you come to redeem your loan. Also, PJ's Pawn Plus charge $2 for each lost pawn ticket. The only consequence of a pawn loan foreclosure is that you lose your pledged item. We do not report the loan foreclosure to any credit bureau or agency. No one will know that you did not redeem your loan. Also, loan foreclosures do not prevent you from taking out more loans in the future.